There’s one more good reason for running a 64-bit flavor of Windows 7: security. There are strict security constraints on drivers that are used to support hardware in 64-bit machines —constraints that just couldn’t be enforced in the older, more lax 32-bit environment. And that leads to the primary problem with 64-bit Windows: drivers. Because of the stricter requirements, many hardware manufactures don’t feel like it is worth their while to create 64-bit drivers for their older hardware. So, if you go the 64-bit route, you’ll need to ensure that your devices have 64-bit drivers available, or you’ll need to replace some hardware. If you’re thinking about going the 64-bit route, you first need to find out whether your computer can even handle it. 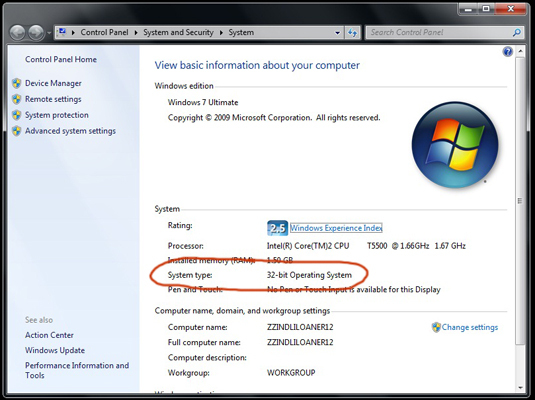 On a Vista computer, you can find that information by following these steps. Click Start→Control Panel→System and Maintenance→Performance Information and Tools. Under System type, see what version of Windows you’re currently running. Under 64-bit capable, see whether you can run a 64-bit version of Windows. The 64-bit capable listing won’t appear if you’re already running a 64-bit version of Windows. If you’re starting out with completely new hardware and you plan to run your PC for a long, long time, 64-bit Windows 7 makes a lot of sense. In the long run, you’ll be better prepared for the future. On the other hand, if you have older hardware that you want to use with Windows 7, do yourself a favor and stick with 32-bit Windows. It’s unlikely that you’ll start feeling the constraints of 32 bits until your current PC is long past its prime.